This time we had a special feeling about going to Congo, partly because we are more familiar to the Congolese circumstances, partly because of January being a record fundraising month. To take part in turning loans and donations to practical entrepreneurship – that feels great. But we also feel a great responsibility handling the money of others. We started the day with porridge and eggs. To the porridge we had a mixture of powdered milk and water. As a matter of fact, it tasted just fine. 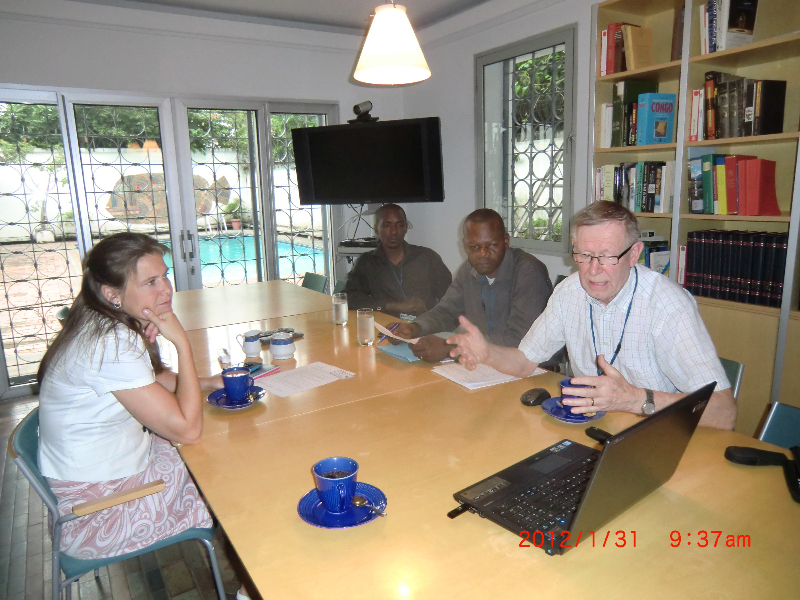 We went to the Swedish Embassy for a meeting at 9.30 with the ambassador, Mette Sunnergren. 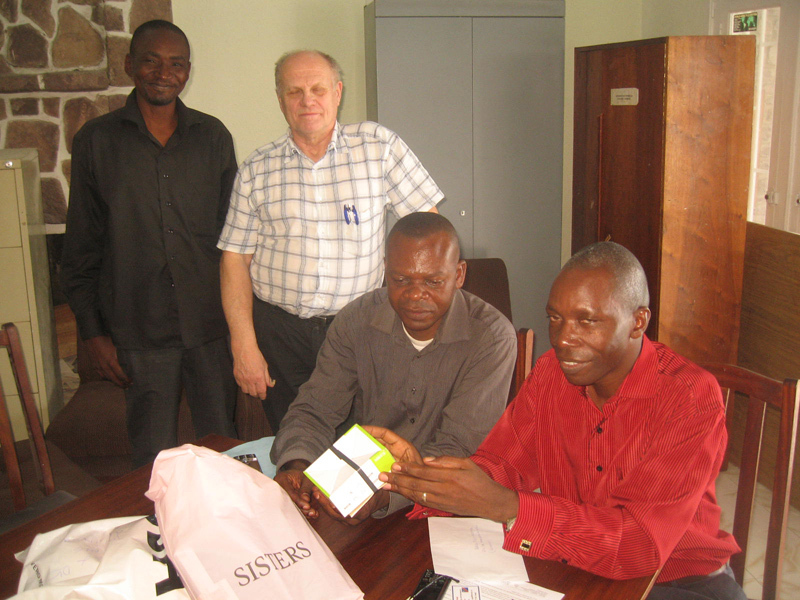 We introduced Matadi Support Group to her with the help of a power point presentation. She shared some of her own experiences with us and we added them to ours. This is the fourth time we visit the Embassy, and it´s starting to feel like home. 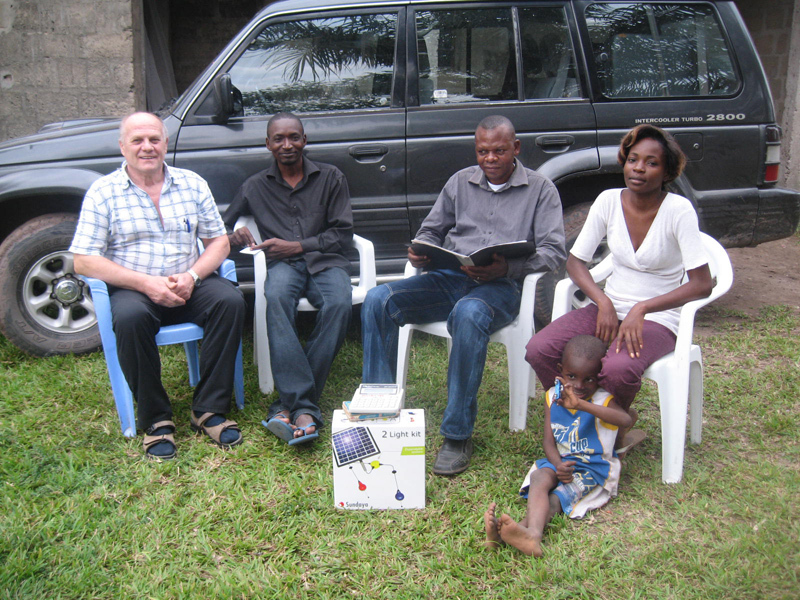 Then we visited Marie France, District Superintendent, but also the pastor of one of Kinshasa´s many churches, Bandalungwa. She is also a gifted entrepreneur. 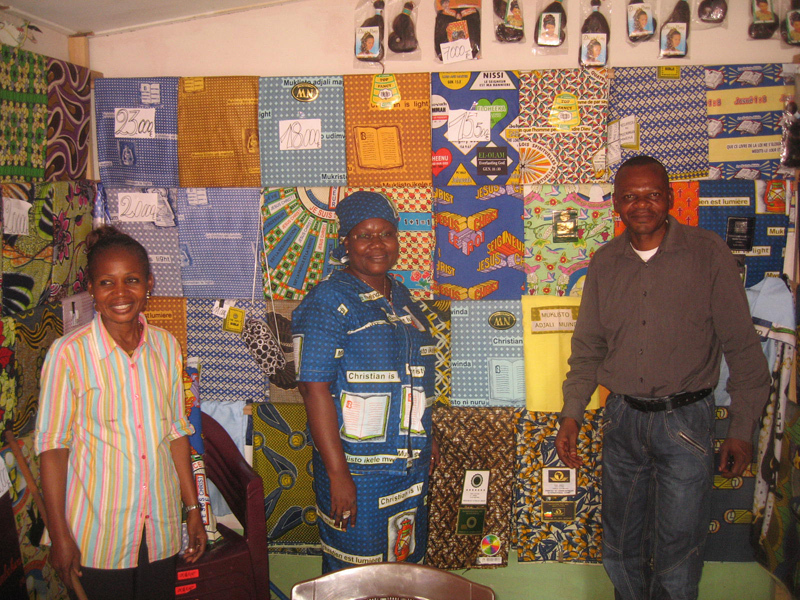 She got a business loan to start a café close to her former place of work, the Kiamvu Church in Matadi. Much of the equipment was already procured and she was just about to open when she was ordered to move to Kinshasa. The move made it impossible for her to realize her business plan. 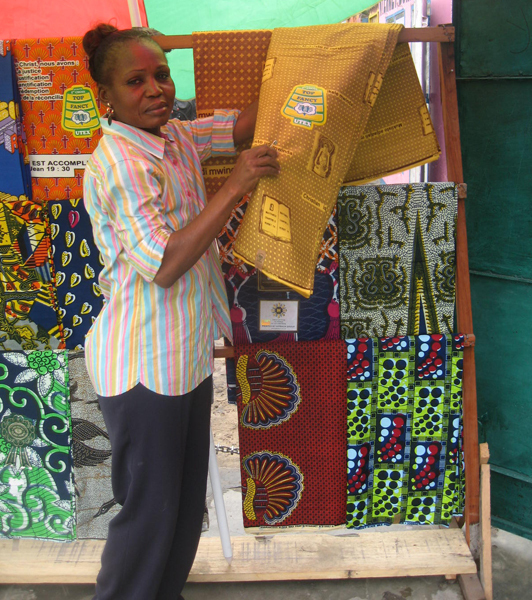 Instead she opened a shop where she sells textile fabrics among other things. There are some photos from her place below in the slideshow. She still thinks about starting a café though, and is now looking for a suitable location, a location where a lot of potential customers pass by. 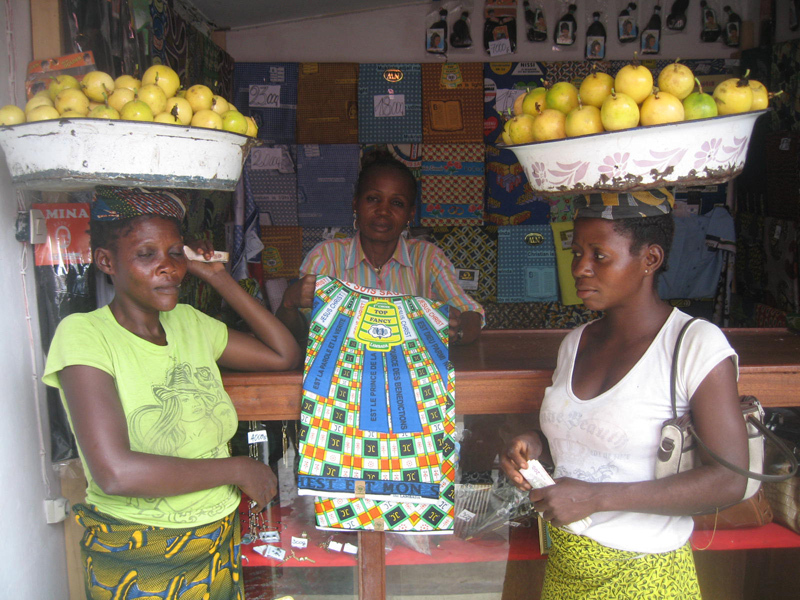 She has kept the equipment she had bought for the café in Matadi. After our educational visit we went to Nzo Binati, where the Swedih Mission Church and Diakonia have moved their offices. We had a chat with Nsimba Andersson, SMC´s representative. We gave him our presentation of MSG. Nzo Binati has been thoroughly renovated since last time. Roof and flooring are brand new, and the walls have got a new coat of paint. It is still a building site – the last parts are being finished right now. By three o´clock in the afternoon we were back. Emma and Julienne had prepared dinner consisting of chicken, potatoes, rice and vegetables. After dinner, Julienne went to her brother´s home. They were having a vigil over his deceased daughter, and the funeral were going to take place the following day. Julienne would stay there over the night, because of the long distance to home. We have used the afternoon to discuss business ideas concerning import of solar cells with Tuto and Yapeco. In addition to that, I have done some paperwork. During the evening it started to rain. It´s easy to keep a check on the raining as the tin roof serve both as roof and ceiling. The rain is much longed-for. 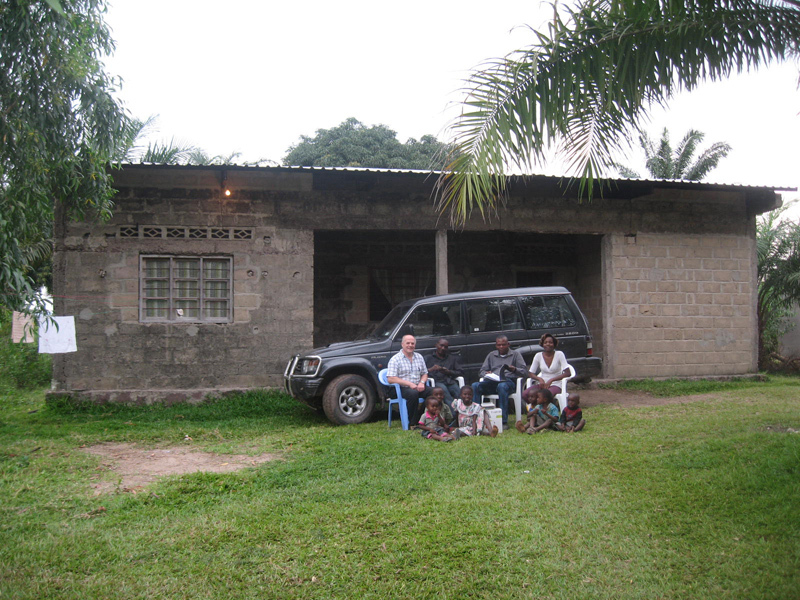 It hasn´t been raining since the beginning of December here in Bas-Congo. It is a catastrophe when it comes to crops. After the sowing in October, there must be rain if it´s going to be any harvest in February.